Men’s Heavyweight Premium Hoodie is in stock. We will print it as soon as you order it. The hoodie is pretty good. i got an xl and it barely fits. i'm not even that big. Loved the style and look but it was my husband birthday yesterday and he tried it on and it was to small, i ordered a size bigger than what he actually wears and it was still to small. 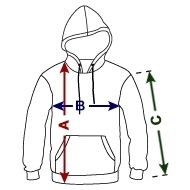 Thick, warm material, nice hoodie. I put the logo down too far, I called the company and they said they'd center it for me up higher and send me a new one. They did free of charge, but they did not change the design or raise the text. It's exactly like the original one. Still overall very happy.